Our air conditioning team has a combined 40 years of experience designing, servicing and installing HVAC systems for residential and commercial projects. In addition, we are a Mitsubishi Diamond Contractor, one of an elite group recognized for their outstanding level of training, expertise and customer satisfaction. RevoluSun is pleased to offer Mitsubishi to our customers. We’ve tested solar AC units and other brands and styles of air conditioners and have found that Mitsubishi’s quality, energy efficiency and customer service fulfill our standards. 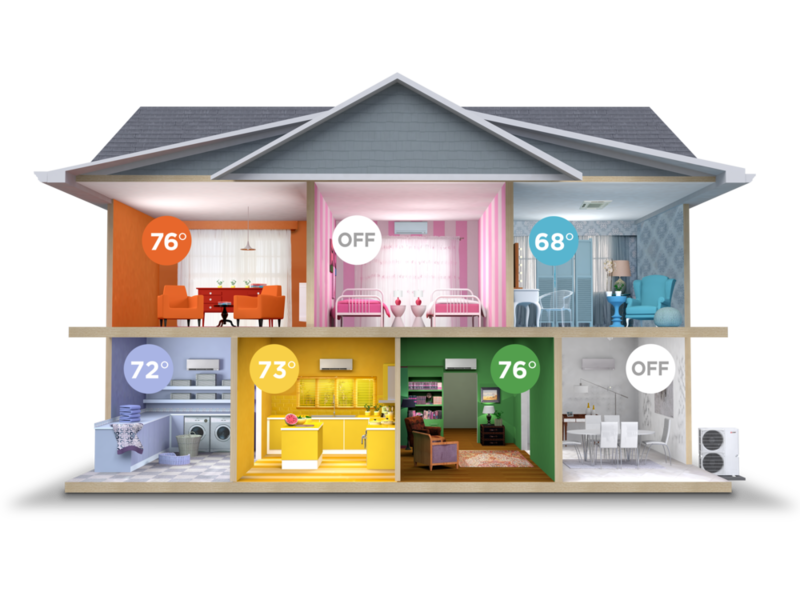 Mitsubishi's Zoned Comfort solutions let you control the temperature in your home room by room, so you only cool rooms you want cooled and cool each room to the exact temperature desired. That's why Mitsubishi systems are up to 40% more efficient than central air conditioning. They can also be retrofitted to existing ducting so you can replace that old, inefficient system that costs a fortune to run. Do you have a window unit that you run on "eco" mode to save money? It probably waits until the room is uncomfortably warm before it kicks in at high gear, makes the room too cold, then shuts off and starts the hot-cold cycle again, right? Not only are you never really comfortable, it's a waste of electricity! Mitsubishi split ACs are 35% more efficient than window units, and thanks to "inverter technology," they use very little electricity to keep the temps constant. Mitsubishi’s rinse-to-clean filters keep your AC running at its best and filter out dust, pollen and other allergens from the air. Make your home a cool oasis of clean air with split air conditioning. When you select an AC system from a Diamond Contractor like RevoluSun, you not only get expert installation, you receive a 12 year warranty on parts and labor. RevoluSun makes that warranty even sweeter. If you maintain your split AC as recommended by Mitsubishi — by getting annual professional maintenance of your system by RevoluSun — we will cover the labor cost for any repairs during those 12 years. That means worry-free operation of your Mitsubishi split AC for 12 years just by doing what you’d do anyway to keep your system in top shape. It pays to Join the RevoluSun! Inspect evaporator coil. Clean as needed. Blow out condensate drain line and clean pan. Inspect electrical disconnect, wiring and connections, associated controls and circuit boards. Visually inspect for signs of refrigerant leaks. Check supply and return air temperatures. Cycle unit for proper operation.